The Jeonbuk Hyundai Motors were stunned by 2nd division Bucheon FC 1995 as Choi Kanghee’s dreams of a treble were dashed once again in the KFA Cup Quarter-Final stage. Found out who made it into the last four below. Jeonbuk Hyundai 2-3 Bucheon FC 1995 It was a simply sensational result that no one had seen coming at the start at the day. On long time club servant Luis’ final match for Jeonbuk (he is making way for a new, foreign singing, yet to be confirmed), the home side took the lead through Kim Shinwook. A recycled corner kick deflected to Kim’s head and a simple free header would suffice. In the 26th minute, Bucheon got a slightly fortunate goal with Wagner poking him a deflected shot from Kim Youngnam. The second half got underway with both teams tied at 1 goal apiece, and surprisingly it was Bucheon with the lion’s share of chances. A spectacular run by Incheon loanee Lee Hokyun forced youngster Jang Yunho to haul him down for a second yellow card. Although Jeonbuk had a quick phase of fighting back following their reduction to 10-men, with a pair of chances that were well saved by Bucheon keeper Ryu Wonwoo, ultimately the lack of that defensive midfielder permitted Lee Hakmin’s searing run through Jeonbuk lines unchallenged to score. Down 2-1 with 30 minutes or so to play, Choi Kanghee made a series of attacking substitutions and it was once again the turn of Bucheon keeper Ryu Wonwoo to shine with at least 3 exceptional saves. Wagner hammered the nail in the coffin on the counter attack and a late penalty conversion by Leonardo was only consolation. Jeonbuk crash out of the KFA Cup, dashing their treble dreams, and little Bucheon hand the giants their first home loss of the season and advance to the semi finals for the first time in their history. Ulsan Hyundai 4-1 Incheon United Ulsan were pure class as they saw off Incheon. 18 year-old Kim Gunwoong opened the scoring with a great strike from 20 yards – his first professional goal. Then Kim Seungjun beat his man in the box and Guinea-Bissau international Frederic Mendy used his strength to tap home. In the 50th minute, Kim Seungjun won a penalty kick and captain Kim Taehwan converted the penalty down the middle. Kim Daejung would score a corner kick a few short minutes later but Mendy converted an indirect freekick to complete a dominant performance from the Tigers – one of their best all season. 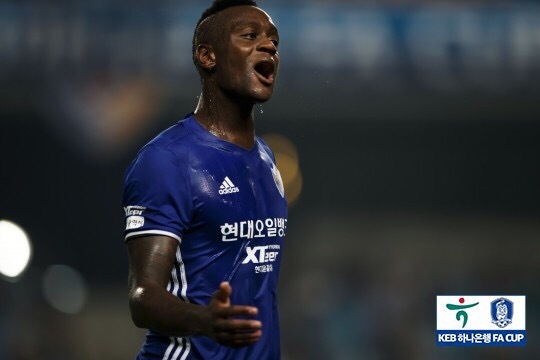 Suwon Samsung 1-1(4-3PSO) Seongnam FC There were cards galore and yet another penalty shootout as the Bluewings prevailed in a dramatic quarter-final match. Suwon had the upper hand in most of the match through attacks from Jonathan and Kwon Changhoon. There was a twist in the plot when handbags during a free kick saw Kim Taeyoon (Seongnam) and Lee Choongseong (Bluewings) sent off for each side. Ko Chawon scored almost immediately after the sendings off in the 24th minute. However, Seongnam were handed a lifeline when Koo Jaryong was handed his second yellow and the Bluewings were reduced to 9 men. As a result, Seo subbed on veteran defender Lee Jungsoo at halftime, and kept Seongnam at bay, but no one could have presaged Pitu scoring directly off of a corner kick in the 84th minute. FC Seoul, Suwon Samsung, Ulsan Hyundai and Bucheon FC 1995 have advanced to the KFA Cup Semi-Finals. Will we see a Super Match semi-final? Can the Bluewings draw a favourable matchup against Bucheon to salvage ACL qualification hopes? Or will the lone citizen club standing stun once again to continue their fairytale dream? The Tavern will of course have full coverage as the 2016 Hanabank KFA Cup wraps up. Great write up Tim. I think Yu Sang-Hun won 4/5 penalty shoot outs. He is so confident taking penalties. It was interesting to see Jeonnam change their goal keeper just before the end of extra time too.